Funky asymmetric earrings that go with the current fashion trends. Made entirely by hand in sterling and fine silver. Heavily oxidised, polished and textured for a rougher feel. The earring with a chain is 10,5 cm long and 2,2 cm wide. 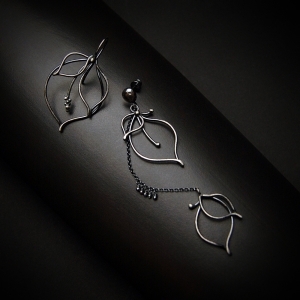 The larger earring is 5 cm long and 3 cm wide. One earring weighs about 4,5 grams.